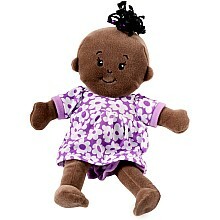 The perfect first doll, with a soft lavender scent and irresistible cuteness! For ages 1-5 yrs, from Manhattan Toy Company. Wee can't imagine a more perfect first doll! 12" of soft, irresistible cuteness! 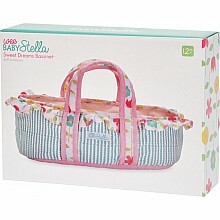 From Manhattan Toy Company, for ages 1-5 yrs. Adorable blue and white striped bassinet holds Baby Stella safely for a nice nap! For ages 1-5 yrs, from Manhattan Toy Company.